This has been a full on week. What week isn't though, huh? Last nights movie fundraiser Now You See Me was a sellout! I was over the moon with over 200 people there, my eyes welled up and I started to choke up when I opened up the night. The biggest thank you to all the staff at the Regent Cinemas Ballarat for supporting my ride and providing such an awesome venue! Ride To Conquer Cancer #askrichard will you come ride with us Richard Branson? 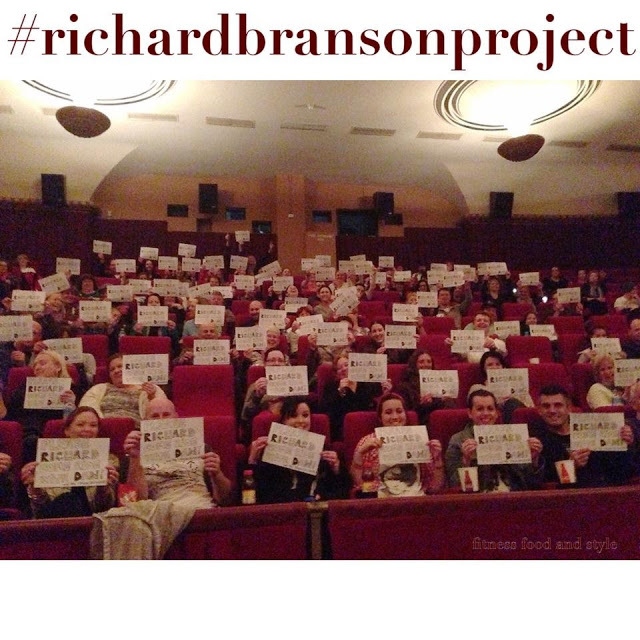 I had to take this opportunity and do my #richardbransonproject picture. We are finalising the video and sending it off to Richard Branson ASAP. I was so grateful everyone participated and I wish I took this with the panoramic view so you could see the impact. It was amazing!!! I would like to thank all my wonderful friends and family who helped me sell tickets. To all the amazing local businesses that supported me and donated gifts Touche Hair Skin Body, Tanya Daniels The Good Guys, Forge Pizzeria, Pauline Dean, Sharp Accounting, EyeFi, T&C Nails, Skin Ski + Surf, amazing High Tech Printing (who donated all the flyers and postcards I was handing out around town), Krooze In Cafe, Athletes Foot Ballarat, Wen & Where, Rokk66 and Elisha from Arbonne. Total door prizes valued approximately $800. Also special thanks to Power FM and 3BA for my interviews. A great way to increase water during our water challenge so please ensure you enter for your chance to win the amazing Lifting Me Higher Tea Prize Pack closes 18th August 2014. I had to be super organised this week with Noah's birthday and the movie fundraiser. Here is our chocolate truffles recipe that Noah had for his birthday as well. NB: you can always soak the pitted dates with the chickpeas so they absorb their flavour! Simply blend all ingredients together and roll into balls in desiccated coconut or cacao powder and enjoy!!! I hope you all had an amazing week, I look forward to next week and the countdown to my first ever Ride To Conquer Cancer!!! WOO HOO!! !